I met with the Chairman of the Biomedical Informatics Department at Harvard Medical School to discuss the question of heart failure in the United States. Approximately 5.7 million adults in the U.S. have heart failure. Heart failure costs the U.S. an estimated $30.7 billion annually. This total includes the cost of health care services, medications to treat heart failurem and missed days of work, according to the Centers for Disease Control and Prevention. The Chair of the Department wanted to create an application that monitors and notifies the respected caregiver of a congested heart failure (CHF) patient. More importantly, a UI that was friendly for family member, nurse, or caregiver to look at the data and could easily intervene on the patient. 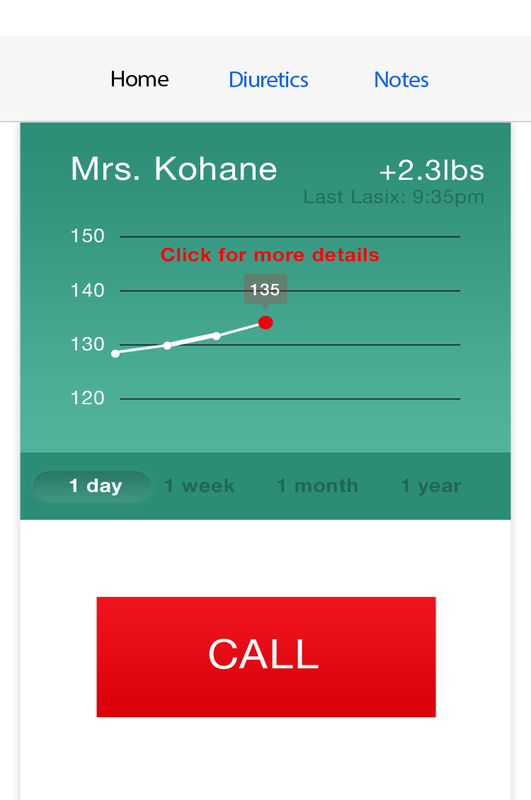 Track the weight gain throughout the day of a patient. If there is more than a pound gained over the course of 2 days, the caregiver can intervene. Track the usage of the proper medication (Lasix) for CHF patients. If the frequency exceeds the doctor's recommendation, the caregiver can intervene. Since this is a sensitive and vital subject, there was an incredible amount of research going into this to exhaust all possible problems. I spoke with medical experts, doctors, nurses, and health & nutritional specialist. Additionally, it was necessary to research the competitors and pioneers in the health and fitness space. This led me to a discussion with the VP of Fitbit, William Crawford. Getting the patients to check their weight each day. Assuring the patients respond accordingly to intervention. Utilizing the wearables that would provide the data to the application. Preventing other related diseases from arising. Saving tons of money in avoiding hospital admissions, nurse visits, etc. I created two different personas: A Registered Nurse and a individual adult caring for her parent. Click on the image for detailed persona. "As a visiting nurse, I want to monitor multiple patients and be notified when I need to intervene." In this User Story, I document a nurse's idea of a typical work day, pain points, and solutions. 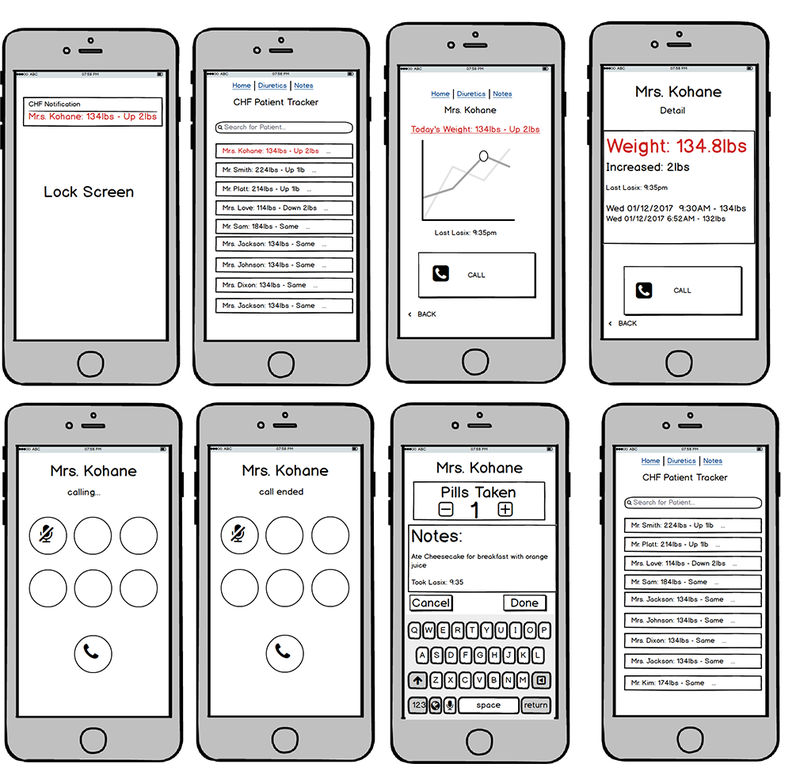 The mantra of having user testing soon and often certainly made the wireframing process go through several iterations. This was fantastic, because I went from a simple pen and paper sketch to several iterations of low-fidelity mockups! The caregiver can receive a notification on the lockscreen alerting her of a CHF patient's needs. Once the caregiver slides or taps on the notification, it will take her directly to the patient's page with a graph. To note: the home page is a patient queue or list that will automatically sync according to the patient's data (weight gain & Lasix). The patient with the highest priority will ascend to the top of the list and the back-end algorithm will place each patient in a relative slot on the list. The caregiver will have the opportunity to call the patient directly from the patient's screen. If the patient picks up the phone and complies with the suggestion, the caregiver can notetake that and also track the medication intake. Once the patient has been cared for, the patient's profile loops back down the queue until next cycle. Lastly, I created some high-fidelity prototypes using a combination of Sketch and Photoshop CC. This interactive demo was created using InVision.